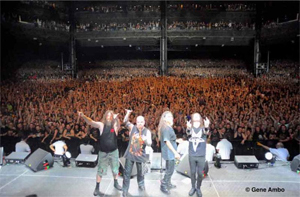 "We always knew this tour would take us into 2019," said SLAYER's Kerry King, "and we've been blown away by the response we've been getting here in North America. We've heard about fans who have driven five, six hours, or flown in from other cities or countries to see us, so we want to assure our fans that we'll be on the road through 2019 and will get to as many places around the world as possible to make it easier for everyone to come and see us one last time." To date, SLAYER's Final World Tour has consisted of Leg One and the just-wrapped Leg Two in North America, with Leg Three taking the band to the UK and Europe from November 1 through to December 8, 2018. The band's announced itinerary also has them headlining Mexico's ForceFest on October 7, 2018, and Hellfest Open Air in France on June 23, 2019. Upcoming announced dates on SLAYER's Final World Tour are listed below.